Ten minutes to showtime and Tyrone Maclin is, in his words, trying to “carny people in” as they pass by Milkie’s on Elmwood. With a drink in one hand, a cigarette in the other, wearing a forest green “Cosby sweater,” Maclin is all loungey charm. But he wouldn’t be outside in the cold yelling at strangers if he weren’t a little worried. He had a full house last week. Tonight is comparatively light. 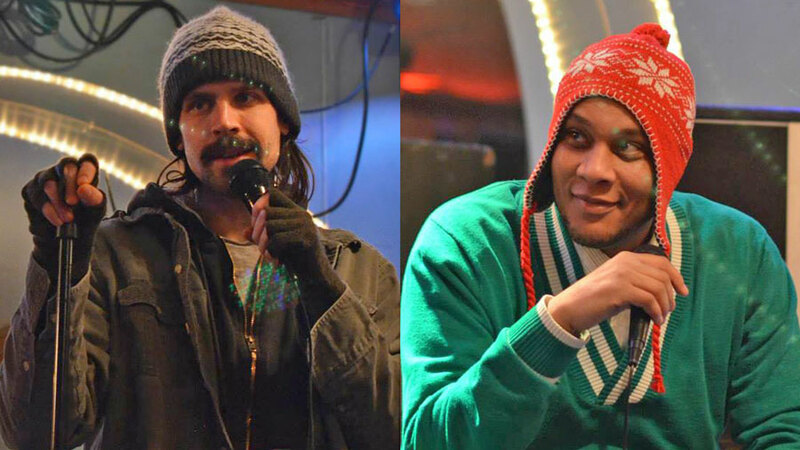 Maclin has hosted the comedy open mic at 8pm each Wednesday at Milkie’s since it started in June. He’s watched it go from relatively quiet to nearly too popular for its own good. Last week, Maclin put up thirty comics. At five minutes a pop, that’s two-and-a-half hours of comedy, plus the delays that occur when the performers, the host and the timekeeper have been drinking since kickoff. That capacity for sustained raucousness is there by design. Maclin’s partner in crime, Kristy Rock, started the Milkie’s mic with her experience watching comedy in Chicago in mind. In Chicago in the 2000s, talented comics like Hannibal Buress, TJ Miller and Kumail Nanjiani were hitting mics all over town. At those mics, the lists ran long and the comics ran the room, creating a home base for veterans and up-and-comers alike. “I want Buffalo to be known as an incubator city,” said Rock. And recreating the kind of incubation that she saw in Chicago means having places nearly every night of the week where comics can work out their material and meet each other. It was at one of these lauded Chicago mics that Rock got introduced to comedy in the first place. Recently separated from her now ex-husband, Rock found herself out for a drink with a friend on a Sunday night. The bar just happened to be hosting a comedy open mic. Rock’s desire to give back to said “idiot scumbugs” led to projects like publishing RE:COM magazine, running BuffaloComedy.com, and starting the mic at Milkie’s. Maclin, too, credits comedy with saving his life. Six years ago, he performed for the first time at Nietzsche’s open mic and caught the attention of the host, comedian Kristen Becker. He sees that same dynamic every week at Milkie’s. With support from Becker and from his brother, Freddie, Maclin kept performing. He’s a good comic, but he’s a great host, and that fact is obvious from the moment the show begins. At 8:00pm sharp, Maclin grabs the microphone and proceeds to corral a room full of chatty comedians into paying attention. He implores everybody to tip the bartender (Nikki Rosenberg, who has become such a staple at the mic that they’ve threatened to make bobbleheads of her) and they’re off. 8:07: The first comic, Tim Victor, kicks things off. 8:22: As BC Garvey performs, more non-comics start showing up to the mic. Maclin’s apparent anxiety about people showing up dissipates. 9:11: Maclin comes over to whisper: “As a child, I always wanted to have a lounge act. Now I do.” He’s right: Milkie’s used to be the Elmwood Lounge. The dim lights and mirrored walls give it a comfortably sleazy charm: half dive, half Vegas. 9:28: Everyone has been at the bar for about two hours now, so I’m not surprised when someone tries to sign up to perform on my notes. 9:35: While introducing Jesse Winterhalter, Maclin segues into Ghostface Killah lyrics, a motif he vows to keep alive all night. 10:17: I never would have guessed the thing that would bring the energy back up after two hours would be a bit about Titanic. You go, Nicky Spin. 10:31: Maclin, at this point, has opened up his intros to the entire Wu Tang Clan. 11:07: It becomes apparent that a big chunk of the non-comics in the room are here to see one particular performer: Kevin Thomas Jr. Maclin tries to sell them on staying for the whole show. They do. 11:22: By now, the performers have been sitting around long enough to write entire routines ripping on Maclin and his bright green sweater. Barbs include “Irish Pride Mr. Cooper” (Juese Cutler) and “The Grinch Who Stole Kwanzaa” (Bruce W.). 11:50: We’re done. I feel a little dazed and tired from laughing; Rock and Maclin, meanwhile, are beaming. Which makes sense. Both Rock and Maclin credit comedy with saving their lives, and they just gave 30-plus comics and a room full of people a chance to get saved, too.